MATCH COMMENT: PETERBOROUGH UNITED 1 DONCASTER 1: Are Posh actually over-achieving? Posh left back Andrew Hughes in action against Alfie May of Doncaster. Photo: Joe Dent/theposh.com. A case is building to claim this Peterborough United squad have over-achieved so far this season. They played well in just one of their four matches over the festive programme so a seven-point return and a position just two points and two places outside the League One play-offs should be seen as a decent outcome. Posh star Marcus Maddison can't believe he hasn't been awarded a penalty against Doncaster. Photo: Joe Dent/theposh.com. And now it’s January. Time for the squad to be strengthened. Time to find a more experienced right-back, a creative midfielder with a goal-scoring touch and a striker to shoulder some of the burden Jack Marriott is certain to be feeling. And it’s not time to sell Marriott or Marcus Maddison either. Manage all that without breaching financial fairplay rules and with Gwion Edwards to come back raring to go for the season’s end and manager Grant McCann could yet have the last laugh over those who revel in his discomfort, mainly on social media. Providing of course he can help his side manage the end of matches better. McCann said Posh got what they deserved on their first outing of 2018 after Doncaster found a 94th-minute equaliser, but he was actually exaggerating. Posh were so sloppy, lethargic and off the pace, they really should have been beaten. They might well have been if their opponents had fielded strikers capable of finishing off some patient approach play. So poor were John Marquis and Alfie May up top for Rovers they rarely even managed to get shots away after Tommy Rowe and co had glided through the Posh midfield. Marquis and May also missed absolute sitters with close range headers in the last two minutes of the 90, but any hope Posh had of a fortunate win, and the place back in the top six it would have secured, were dashed when Ben Whiteman slotted home from close range in the fourth of five minutes added time. The timing made it a cruel blow for a team who tried to cover a lack of quality with sheer effort despite some obviously tired limbs (Rowe admitted Doncaster’s extra day to prepare for the game could have been a factor towards the end), but the manner of the equaliser had Posh fans bellowing in frustration. The chances missed by Marquis and May both arrived from left wing crosses and yet, with just 90 seconds left, there was Posh right-back Alex Penny faced with two opponents, one of them the mercurial Rowe. 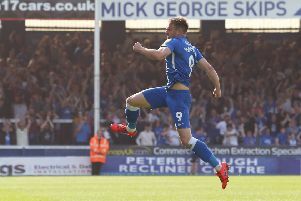 Sure enough room was found for May to shoot and although Steven Taylor blocked his effort on goal, the ball fell kindly to Whiteman who scored with ease to send his manager, the triple promotion-winning Posh boss Darren Ferguson, scampering down the touchline in delight. An equaliser scored in Fergie time on his old manor was obviously a great moment for him. Chris Forrester on the ball for Posh against Doncaster. Photo: Joe Dent/theposh.com. Not so much for a man who played with great style for him in the most recent Posh glory days. Questions were again being asked of McCann soon after the final whistle as to why Liam Shephard, a specialist right-back, hadn’t been sent on to protect Penny when it was Doncaster’s sole attacking avenue in those final stages. It would have broken the play up for a start. Instead Posh, who had their opponents trapped in their own half, were caught out by a raking pass from wing-to-wing, a fine ball for sure, but not one which should have led to an outnumbered defence with a precious lead to protect. Justice was done though. Even Danny Lloyd’s 10th goal of the season - a close range volley after Ryan Tafazolli had nodded Marcus Maddison’s free kick back across goal - in the 14th minute gave Posh a lead they hadn’t earned. Posh competed well for the rest of the first half and Lloyd almost struck again just before the break when accepting a fine pass from Michael Doughty, beating his man before seeing a low shot kicked away by visiting goalkeeper Ian Lawlor. But once Chris Forrester’s terrific 30-yard volley had slapped the outside of a post on 55 minutes, Posh rather disappeared as an attacking force as Lloyd’s input lessened and Maddison endured one of his non-going days. Naturally Maddison still left a mark on the game by receiving a caution for simulation on the half hour mark after racing onto a Marriott pass and tumbling under challenge from Lawlor. Referee John Brooks was in no doubt it was a dive, but as he was useless and inconsistent all afternoon it would be foolish to take his word for it, especially as he denied Gwion Edwards a rather more obvious penalty at Charlton earlier this season. But Maddison’s reputation is also to blame if Lawlor did indeed make contact. His first act in this game was to fall and scream under the most innocuous of tackles, an incident which Brooks rightly ignored. “If Marcus did dive, I’d be very disappointed in him,” McCann stated. “But the officials made some bewildering decisions all afternoon. They weren’t the only ones, although credit to substitute Leo Da Silva Lopes for the energy he brought to the final quarter of the match, to Forrester for continuing his steady return towards top form and to Tafazolli for defending with great determination anad spirit. Let’s hope the re-inforcements arrive before the next League One match, a daunting trip to leaders Wigan on January 13. Posh: Jonathan Bond, Alex Penny, Andrew Hughes, Steven Taylor, Ryan Tafazolli, Anthony Grant, Chris Forrester, Michael Doughty (sub Leo Da Silva Lopes, 62 mins), Danny Lloyd, Marcus Maddison (sub Junior Morias, 87 mins), Jack Marriott. Unused substitutes: Idris Kanu, Conor O’Malley, Jermaine Anderson, Lewis Freestone, Liam Shephard. Doncaster: Ian Lawlor, Matty Blair, Niall Mason, Andy Butler, Joe Wright, Liam Mandeville (sub Alfie Beestin, 66 mins), Jordan Houghton (sub Rodney Kongolo, 72 mins), Tommy Rowe, Ben Whiteman, John Marquis, Alfie May. Unused substitutes: Craig Alcock, Mathieu Baudry, Marko Marosi, Issam Ben Khemis. Goals: Posh - Lloyd (14 mins). Doncaster - Whiteman (90 + 3 mins). Cautions: Posh - Maddison (simulation), Penny (foul). Doncaster - Wright (unsportsmanlike conduct), Mason (foul).